Initiated in 2013, this two year study evaluates the side-by-side performance of two common Low Impact Development stormwater management practices subjected to the same local contexts and climate. 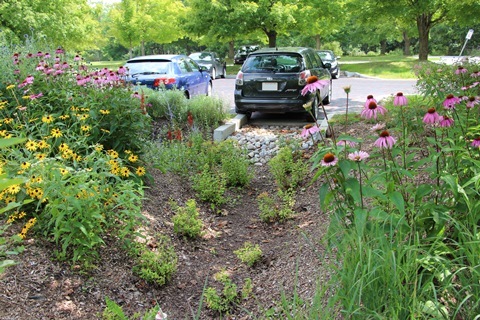 The bioretention cell and infiltration trench examined in this study were constructed at the Kortright Visitor’s Centre Green Parking Lot, which also features a variety of permeable and non-permeable pavement types. It is commonly assumed that bioretention cells provide superior treatment of stormwater runoff than infiltration trenches due to the opportunities they provide for pollutants to interact with soil filter media, mulch and vegetation. This study tests this assumption by directly comparing treatment performance of the two types of practices. Both practices examined in this study have the same drainage areas, and runoff enters each facility through geotextile-lined stone inlets where it is directed into subsurface infiltration areas of the same size. This side-by-side design allows for the two practices to be compared with respect to their capacity to reduce runoff volumes and contaminant loads, as well as various functional attributes. An untreated reference asphalt pavement in the same parking lot, and subject to similar contaminant sources, serves as the control for the study. Key parameters examined include runoff volume, runoff reduction, surface ponding and infiltration, effluent quality and temperature, pollutant load reductions, and maintenance requirements. Findings from this evaluation indicate that the bioretention cell and infiltration trench provide comparable treatment of runoff quantity and quality. Both practices reduced runoff volumes by more than 79%. The bioretention cell provided better runoff retention, due to the presence of filter media and vegetation, which offer additional capacity to retain runoff and promote evapotranspiration. It can be concluded that infiltration trenches with geotextile-lined inlets can provide runoff quantity and quality treatment performance similar to bioretention cells, while occupying less surface area and reducing construction and maintenance costs.